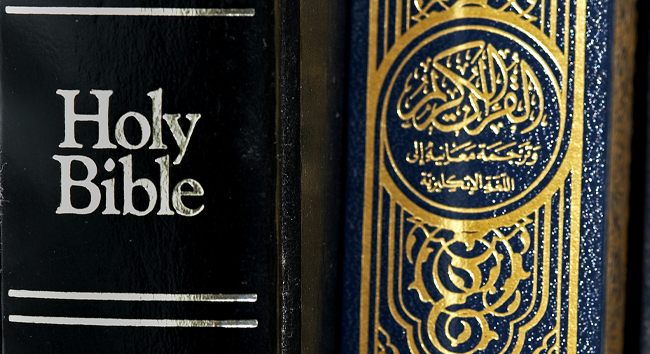 Media > Reasonable Faith Podcast > Do Christians and Muslims Worship the Same God? This age-old question has been in the news lately! Dr. Craig responds! Transcript Do Christians and Muslims Worship the Same God? KEVIN HARRIS: Do Christians and Muslims worship the same God? Perhaps by the end of this podcast we’ll know. But this has been quite a controversy, and it began at Wheaton College. DR. CRAIG: My alma mater. KEVIN HARRIS: Christianity Today and other publications have picked up on this. Of course, if you are familiar with Wheaton, it is an evangelical school in suburban Chicago. Obviously, a controversy here at your alma mater. DR. CRAIG: Yes, indeed. She was finally released from the college because she could not apparently satisfy the administration that her beliefs in this regard were consistent with orthodoxy. KEVIN HARRIS: Phillip Ryken, president of Wheaton, notes, “The College has no stated position on the wearing of headscarves as a gesture of care and concern for those in Muslim or other religious communities that may face discrimination or persecution.” So the hijab is a headscarf worn by Muslim women. He said that is not the issue. Apparently, it was the issue of whether we are both people of the book and whether we worship the same God. DR. CRAIG: That was the real crux of the issue. Her claim that Christians and Muslims worship the same God. Bill, you have been through Beckwith’s statements here. DR. CRAIG: I find myself on an opposite side here with Frank, who is a good friend, fellow member of the Evangelical Philosophical Society, and person that I’ve collaborated with both in writing projects as well as in conferences. So it is very interesting to me to see the sort of defense that he gives for the claim that Christians and Muslims do, in fact, worship the same God. DR. CRAIG: Right. She clearly made a misstep there where she said that we are all people of the book because when the Qur’an mentions “the people of the book” they mean Jews and Christians. They called them that because of their belief in the authority of the Bible. For Muslims, when you talk about “the people of the book” you mean Jews and Christians. You are not talking about yourselves as Muslims. She has made, I think, a minor misstep in characterizing Christians and Muslims as both being people of the book. KEVIN HARRIS: The only way, I guess, you can compare it is that we both would look to a particular collection of books (in our case) and the Qur’an (in the Muslim’s case) as being authoritative or inspired from God. So we both have our sacred scriptures. But “people of the book” has a specific denotation. DR. CRAIG: That is right. That is a technical term in the Qur’an that has a specific usage. I think this is a minor point, but she does get that wrong, what that phrase means. KEVIN HARRIS: Let’s read from Dr. Beckwith’s article. Now on to the big question: Do Muslims and Christians worship the same God? To answer it well, we have to make some important philosophical distinctions. First, what does it mean for two terms to refer to the same thing? Take, for example, the names “Muhammed Ali” and “Cassius Clay.” Although they are different terms, they refer to the same thing, for each has identical properties. Whatever is true of Ali is true of Clay and vice versa. (By the way, you can do the same with “Robert Zimmerman” and “Bob Dylan,” or “Norma Jean Baker” and “Marilyn Monroe”). So the fact that Christians may call God “Yahweh” and Muslims call God “Allah” makes no difference if both “Gods” have identical properties. DR. CRAIG: Let me interrupt there and comment. Beckwith, as a philosopher, construes this question as about the theory of reference – what does it mean to refer to the same thing? This is a profound philosophical issue that actually lies very much at the heart of the work that I’ve been doing on God and abstract objects. How do terms refer to objects? He asks the question, “What does it mean for two terms to refer to the same thing?” These are called co-referring terms. Two different words, two terms, refer to the same object or referent or denotation. He gives the example of Muhammed Ali and Cassius Clay, and then he says “although they are different terms, they refer to the same thing.” Why? “For each has identical properties.” So he is laying out here a sufficient condition for two terms to be co-referring, and it would seem to be the following: if the referents of two terms have identical properties then the terms refer to the same thing. If the referents (or the denotations) of two terms have identical properties then these two terms are co-referring – they both refer to the same thing. We can accept that for the sake of argument. Let’s accept that that is a sufficient condition for two terms referring to the same thing, namely the referents or the objects of those terms have identical properties. Now he wants to apply this to terms for God. And he says, “So the fact that Christians may call God ‘Yahweh’ and Muslims call God ‘Allah’ makes no difference if both ‘Gods’ have identical properties.” What he is trying to show is that in the case of Allah and Yahweh this sufficient condition that he has stated is fulfilled. Remember, that sufficient condition is that if the referents (or denotations) of two terms have identical properties then the terms refer to the same thing. He is arguing that if the referents of “Yahweh” and “Allah” have identical properties then these two terms refer to the same thing. I think we can accept that for the sake of argument. The problem is that Yahweh and Allah do not have the same properties. Although Muslims and Christians may both embrace classical theism – a kind of generic monotheism – the Muslim concept of God and the Christian concept are very different concepts. In my own work I have focused upon the trinitarian nature of God in Christianity in contrast to Islam which is a unitarian doctrine of God. It believes God is just one person whereas we Christians believe God is three persons. I also think that the nature of God in Islam is radically different than God’s nature in Christianity in that the God of the Bible is an all-loving God who has universal, unconditional love for all people. That is very different from the God of the Qur’an who is not all-loving, who has no love for unbelievers and non-Muslims, but reserves his love only for those who do the confession and pay alms. Then God will assign love to them. You have in Islam and Christianity Gods which appear to have different properties and therefore don’t fulfill this sufficient condition that Frank has stated – if the referents of Yahweh and Allah are identical in their properties then the two terms refer to the same thing. It would seem that that condition isn’t fulfilled and therefore his argument fails. Frank, as a good philosopher, is well aware of this problem. KEVIN HARRIS: He anticipates it. DR. CRAIG: He anticipates it. He will go on then to appeal to a well-known phenomenon of referring to something by means of a false description. Why don’t you read that section of the article. Would it follow from this that Fred and Bob do not believe that the Third President of the United States was the same man? Of course not. In the same way, Abraham and Moses did not believe that God is a Trinity, but St. Augustine, St. Thomas Aquinas, and Billy Graham do. Does that mean that Augustine, Aquinas, and Graham do not worship the same God as Abraham and Moses? Again, of course not. The fact that one may have incomplete knowledge or hold a false belief about another person – whether human or divine – does not mean that someone who has better or truer knowledge about that person is not thinking about the same person. DR. CRAIG: Right. All right. What he is talking about here is the phenomenon of referring to something under a false description of that thing. Let me illustrate. Suppose you and I are observing a couple walking down the street and their behavior toward one another. I remark to you, “Her husband is kind to her.” We both know whom I am referring to. I am talking about that man that we are looking at who is walking and being kind to this lady. But suppose, in fact, that that is not her husband – it is somebody else that she is walking with. And suppose that her husband is, in fact, mean and nasty and cruel to her. In that case, my sentence, “Her husband is kind to her” would be literally false if you take it to refer to her husband because he’s not kind to her. But we meant to refer to the man we are observing. He is kind to her. I have successfully referred to this man under a false description of him. I’ve used a literally false description in referring to this person. Frank wants to suggest that this is what happens with Christianity and Islam. He says, “The fact that one may have incomplete knowledge or hold a false belief about another person . . . does not mean that someone who has better or truer knowledge about that person is not thinking about the same person.” That is right. You can refer to someone under a false description. But notice it doesn’t mean that he is thinking about the same person. Maybe the conceptions are so fundamentally different that the terms are not co-referring. Apply that to the God of the Bible and the God of the Qur’an. Is this just a case of referring to the same God under a false description in one case? Or are they in fact referring to two deities just like someone talking about the Immaculate Conception and the virgin birth are really referring to two different things. What Frank has not done in his article is he hasn’t given us the necessary conditions for two terms to be co-referring. He has given us sufficient conditions for when two terms are co-referring, but he hasn’t told us what conditions must be met for the two terms to be co-referring. His argument simply doesn’t go through. The article ends too abruptly at this point. He has only shown that if two referents have identical properties then the terms refer to the same thing. But he hasn’t shown us under what conditions you must be referring to the same thing when they have radically different properties. When I deal with this question in my work on Christianity and Islam, I think it is best just to avoid these problems that arise from reference by asking instead about the Muslim and Christian concepts of God. Do the Muslim and the Christian have the same concept of God? Here I think we can argue that the conceptions of God in Christianity and Islam are so fundamentally different that they are not the same God. It is not just a matter of the Trinity being different. It is also a matter, as I say, about the very moral character of God. I think that the Islamic conception of God is a morally defective concept because God is not an all-loving being. He loves conditionally only those who first love him, say the confession, pay the alms, and do the prayers. Those are the ones that God loves. In addition to contesting the Trinity and the incarnation, Muslims also contest the Christian claim that God is love — unconditional and indiscriminate love. There is no claim in Islam that God “justifies the ungodly” and no command to love one’s enemies. But these are the signature claims of the Christian faith. Take the redemption of the ungodly and the love of enemy out of the Christian faith, and you un-Christian it. I wish that those who insist that Christians worship an altogether different God than Muslims latched on to this difference — that instead of wanting to “end” Muslims they deem to be their enemies in the name of God, they would seek to embrace them in the name of Christ. If they did so, they would need to show how struggle against enemies is a way of loving them — an argument that many great theologians in the past were willing to make. I think that Volf sees the fundamentally different conceptions of God in Islam and Christianity with respect to the moral character of God and God’s being an all-loving being which is radically different, as he says, from the Muslim concept of God. In my view, rather than mask over these differences and attempt to have schmoozy interfaith dialogue, and to say “we all believe in the same God, and we really worship the same deity,” we need to draw clear lines of differentiation and honestly talk about our differences. KEVIN HARRIS: That is exactly what is going to happen here probably from the Christianity Today article and just from what I’ve seeing blowing up on the Internet from Frank’s article, and that is there is going to be a lot of schmoozy, “We are just worshiping the same God.” That can cause downright confusion. DR. CRAIG: Someone like Volf thinks that in a world which is riven by jihadism and inter-religious strife, that we need to do everything we can to promote peaceful co-existence and get along with each other. I think the demands of the day are much different. I think in an age of increasing religious relativism and ontological pluralism, that we need to emphasize the clear differences between Christianity and Islam, and that is a way of loving one’s neighbor. Muslims with whom I’ve dialogued and that I’ve talked to have appreciated my honesty in differentiating the Christian concept of God from the Islamic concept of God and have appreciated the arguments that I have given for the superior truth of the Christian conception. We can do this in love without promoting strife and hate precisely because we, as Christians, worship a God who commands us to love all people just as he does – unconditionally. KEVIN HARRIS: This brings up two more quick issues that I can see. One is the implications for Mormons – for the Latter Day Saint Church here. Do they worship the same God? They claim to. When you are reaching out to your Mormon friends with the truth of Scripture, this is an issue that is going to come up. DR. CRAIG: This is one that I thought of as I read Frank’s article. Would he say that Mormons and Christians worship the same God? Here in defense of Frank I think he would not. He understands Mormon theology well. He is from Nevada and has had extensive experience in talking with Mormon theologians. I think Frank would say that Mormons, in contrast to Muslims and Jews, are not classical theists. They are, in fact, polytheists who believe in humanoid, finite deities that inhabit planets in outer space and have universes under their sway and that we are on our way to deification. Therefore, I think Frank would insist that Mormons and Christians do not worship the same God. But what he wants to say is that just as Jews and Christians worship the same God, so do Muslims and Christians worship the same God even though Muslims do it under a false description of God. What I’ve argued is that the differences between the Muslim concept of God and the Christian concept of God are so stark that Frank hasn’t given us any reason to think, in view of their non-identical properties, that they are worshiping the same God. This occasions a different question. What about the Jew and Christian? Do Jews and Christians worship the same God? How can we say that we worship the same God that Abraham and Moses did when they didn’t believe that God was a Trinity, but we do? Here is what I would say in response to that question. The Christian does not reject the Jewish concept of God as the Muslim explicitly rejects the Christian concept of God. The Christian finds the same God of the Old Testament more fully revealed in the New Testament. He doesn’t repudiate the God of the Old Testament. He believes that the God of the Old Testament reveals himself more fully in the New Testament. By contrast, the Muslim repudiates the concept of God found in the New Testament. He says this is the result of corruption and legend. He rejects the concept of God found in the New Testament. That is very different than the Christian attitude toward the God of the Jewish Old Testament. On the other hand, if I were an orthodox Jew then I would say that Christians have such a different concept of God that they are worshiping a different God than I am. If I were an orthodox Jew I would say the same thing about Christians that I think we should say about Muslims – they are worshiping a different God than the God that I worship. Look at how the orthodox Jews reacted to Paul’s preaching of the Gospel. Paul considered that he was preaching the same God of his fathers, as Jews, but the orthodox Jews did not agree. They thought that Paul was a heretic. It depends on your perspective. I think from the perspective of the orthodox Jew he would be justified in saying Christians worship a different God just as I think from a Christian perspective we are justified in saying Muslims worship a different God. The real question here is who’s conception of God is correct? KEVIN HARRIS: That is what it comes down to, doesn’t it? DR. CRAIG: It really does. I think the question of worshiping the same God is a red herring that frankly takes you into philosophical debates about referents that are ambiguous and unclear. Frank doesn’t give us necessary and sufficient conditions for when two terms are co-referring even though the referents have different properties. This is a knotty philosophical question. The more important question is to show the different conceptions of God in these different religions and then to ask, “Where does the evidence point?” Which conception of God, if any, is the true conception of God? That has been the focus of my debates with Muslim apologists and theologians who argue that the Christian concept of God is correct whereas the Muslim concept of God is false. See https://www.wheaton.edu/news/statements/statement-regarding-trustee-community-report/ (accessed November 27, 2018). See https://www.thecatholicthing.org/2015/12/17/do-muslims-and-christians-worship-the-same-god/ which Kevin will quote from again later on in this podcast. (accessed February 8, 2016). Dr. Craig meant to say “Christian and Muslim” conceptions of God, not “Islamic and Muslim” conceptions of God. This transcript corrects this error. https://www.washingtonpost.com/news/acts-of-faith/wp/2015/12/17/wheaton-professors-suspension-is-about-anti-muslim-bigotry-not-theology/ (accessed February 8, 2016).